Magnum Primo 100 mg is an anabolic steroid, a derivative of dihydrotestosterone with weak androgenic activity and moderate anabolic effect. 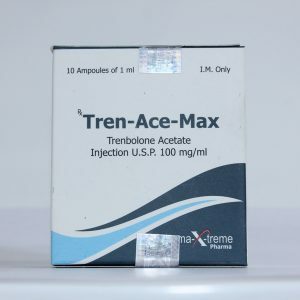 Available in tablets (Primobolan) and in injectable form (Primobolan Depot). Many athletes compare Magnum Primo 100 for effectiveness. 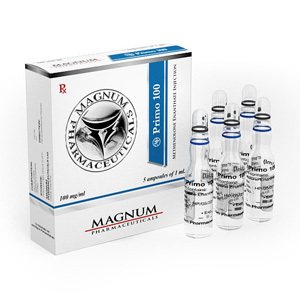 Magnum Primo 100 is an injectable form of the drug, which is methenolone enanthate ester. The injection form has a long period of action (due to the gradual transition of the drug from the muscles into the blood), approximately two weeks. 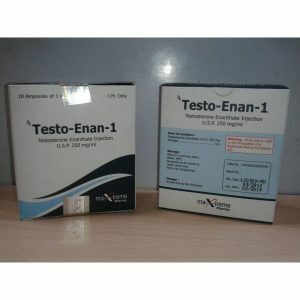 In terms of the duration of action, Primobolan Depot is similar to Testosterone enanthate. The main disadvantage of this form lies in the pain of injections. Rarely acetate is found with a short half-life of approximately 2-3 days. Primo 100 is a unique steroid whose properties are not possessed by any other drug. Primo 100 does not cause estrogenic side effects, which is a significant advantage over other steroids. This means that acne, swelling, and other negative effects do not threaten the one who uses the take. Thus, Primo 100 is very attractive, compared to other steroids, for those who have a tendency to side effects. Due to the low binding of water seen with its use, Primo 100 is often more effective than other drugs. It is not only effective due to a decrease in the level of water binding in the body, but also turns out to be very useful because of its anabolic nature, which has a positive effect on the development of muscles. The only disadvantage of Primo 100, which is known is the slow increase in muscle mass (the result usually takes more than eight weeks). Due to the lack of puffiness, muscle growth, which will be noticeable when using Primo 100, will really be an increase in quality meat, and not water retention in the body. The increased muscles, when using prima, are better preserved, although not so rapidly increasing, as when using other drugs. But make no mistake – although prima does not adversely affect as other drugs, but post-course therapy is still necessary, for this you need to use Nolvadex or Clomid.